If you’re focused on eating healthy, maybe you’ve been avoiding the “p-word” for quite some time – but it’s time to rethink what pizza has to offer. 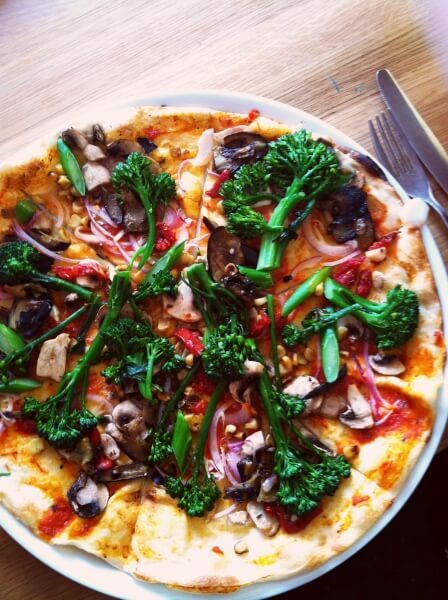 We’ve compiled a list of the healthiest pizza places, as well as our top pick from each. So when it comes to pizza – there’s no more guilt, no more avoidance, and a whole lot more satisfaction (and veggies). 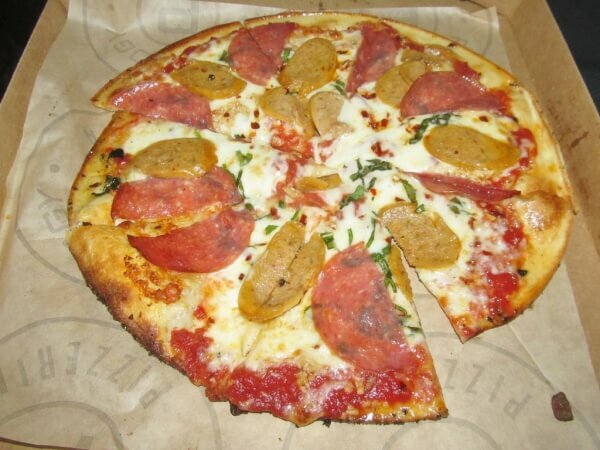 Blaze Pizza is one of the healthiest pizza places, offering fresh ingredients and an option to build your own pizza (BYO). With freedom like that, you’re able to decide if you want to go all out with the veggies or pile your pizza with cheese. 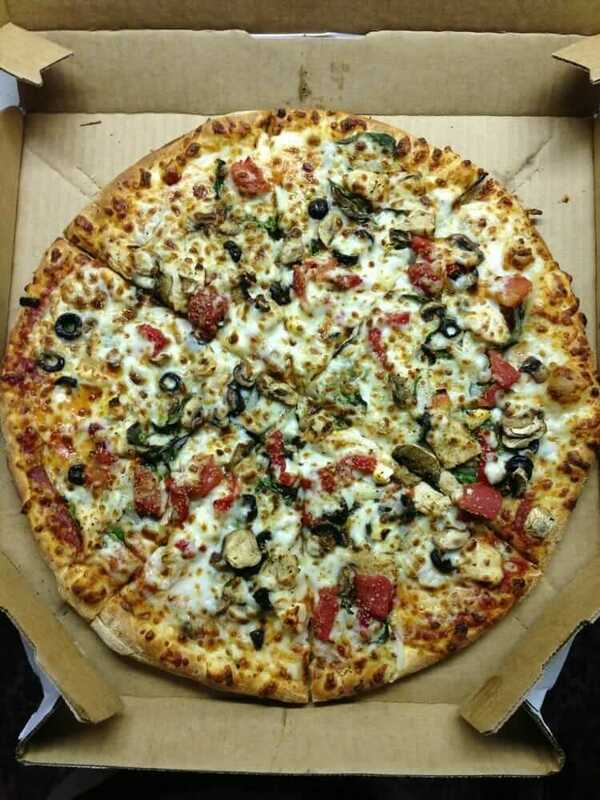 The Veggie and Chicken Pizza is part of Domino’s “Lighten Up” pizza series, offering other healthy options like the Veggie Pizza, the Chicken, Green Pepper, and Onion Pizza, the Chicken and Ham Pizza, and the Ham and Pineapple Pizza. Each of these pizzas has less cheese than the standard and is loaded with veggies and lean meat. You may recognize CPK from the frozen food section at the grocery store, but unless you have one nearby, you might not know they serve piping hot pizzas at their very own restaurant, too. California Pizza Kitchen offers a lot more than healthy pizza, though. The menu includes small plates, appetizers, flatbreads, soups, salads, main plates, and pasta. And for those of you who are trying to avoid a carb load, California Pizza Kitchen now has a cauliflower crust available for an additional charge. 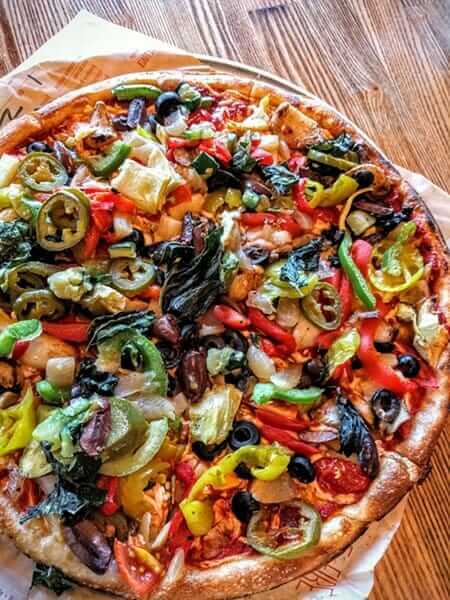 Pizza Hut is not known for being one of the healthiest pizza places around, but it is making efforts to cater to the health-conscious crowd – The Veggie Lover’s pizza being one of their top sellers. Without the thick, greasy crust, you won’t have to worry about consuming too many carbs, and loads of veggies on top replace other fatty toppings. 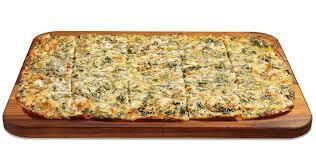 The Spinach Alfredo is part of Cici’s flatbread line, which has played a huge part in making Cici’s one of the healthiest pizza places to visit. The two other flatbreads are the Chicken Bacon Club and the Honey BBQ Chicken. Papa John’s, like other traditionally unhealthy pizza joints, has been making strides to become one of the healthiest pizza places. Now, they offer what they call “Lighter Choices” including the Mediterranean Veggie, Hawaiian Chicken, Tropical Luau, and Chicken and Veggie. The Hawaiian Chicken Pizza from Marco’s might have slightly fewer calories per slice than other options from the healthiest pizza places, but the majority of those calories are from protein, so it’s a fair trade-off. Papa Murphy’s was made famous for being one of the healthiest pizza places, but also for being the biggest “Take ‘N Bake” restaurant, meaning customers come into the store, order the pizza, and take it home and bake it at their own convenience. You can create your own pizza or order one of the signature recipes, but if you want to ensure the pizza you take home is as healthy as can be, it’s best to select the ingredients yourself. Try to eat no more than two slices a day. This way, you can stay under 500 calories from your pizza consumption. Think of it as a treat instead of a diet cheat. Thinking of it as a cheat day item would make you crave for it more! Stick to thin crust offers. A thick crust pizza may immediately add 300 calories for two slices while thin crust pizzas would only have around 150-200 calories for two slices. 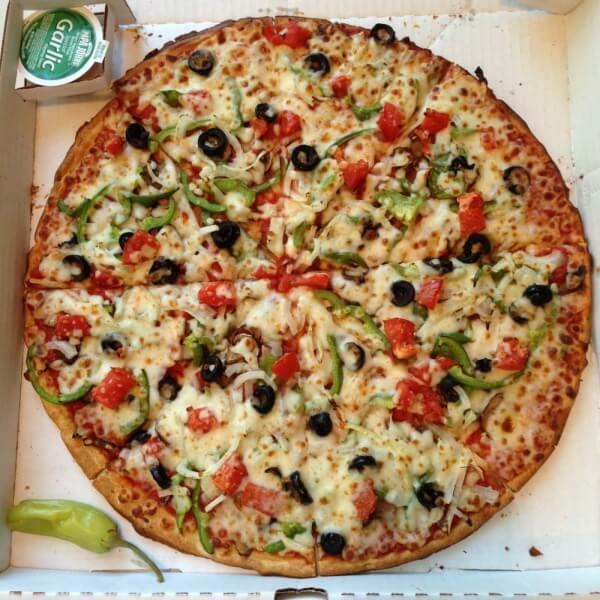 Choose your toppings well. Stick to veggie pizzas which have wholesome toppings like spinach, mushrooms, olives, green and red bell peppers, or pineapples. If you can, request for less ham on your ham and pineapple pizza. Know your cheeses. 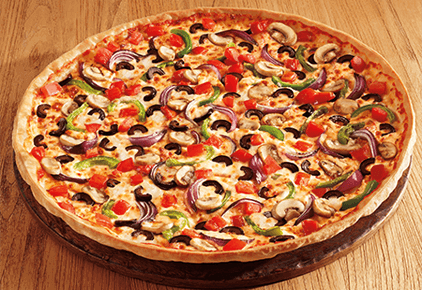 One big trick would be to choose less cheesy-topped pizzas and go for the more tomato-based ones. Less cheese would mean fewer calories, but when you can, try asking for cheddar instead of mozzarella cheese because it has a 1 /3 of usual mozzarella pizza calorie-content. Go for personal sizes. These are smaller and you can enjoy the thought of having a “whole” pizza for yourself when you decide to order this. 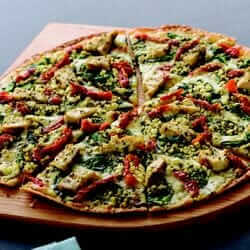 To make this even better, go for a thin-crust personal pizza and enjoy the same pizza goodness without too much bulk. Balance it out with the drink you choose. Instead of going full out on your pizza dinner treat, cut back on the calories by having juice with it instead. 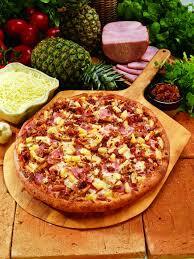 Pineapple or orange juice can make great pizza accompaniments especially if you already ordered a veggie-based pizza. If you’re not looking for the healthiest pizza places, try these other healthy fast food options.